It’s probably safe to say that most photographers are gearheads to some degree, whether we’ll admit it or not. We devote much effort into researching all the specs and reviews to find the cameras and lenses that suit our needs as closely as possible. But as a photographer who shoots mostly while hiking or backpacking, I am as much concerned about HOW I carry my camera as I am with the camera itself! When it comes to finding a photo backpack that not only provides easy camera access but is actually designed for carrying weight comfortably on long treks, the options are surprisingly few. The vast majority of dedicated photo-bag companies seem to have a design philosophy based entirely around camera storage, with human ergonomics a distant afterthought. These backpacks offer endless configurations for camera and lens compartments, but they are typically overweight with under-built, poorly designed suspensions (the frame, shoulder straps, and hip belts) and little extra space for normal hiking/camping gear. These packs might be good for carrying gear across the street from your car to a roadside overlook, or maybe even for a short day hike, but serious hikers cannot rely on these backpacks to comfortably carry a load for many miles. The obvious solution for most hiking photographers is to simply stuff their camera gear into a real backpacking backpack and deal with the inconveniences. 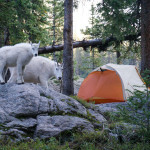 The outdoor backpacking companies really know how to make comfortable, high performance backpacks; however, quick and efficient camera access is usually not even a consideration at all. This huge gap between camera-centric and athlete-centric backpack design has left a big niche market which is begging to be filled, but with surprisingly few companies attempting (successfully) to do so. The only company I know of that is proactively filling this niche is F-stop, but the demand for their packs is so great that they cannot keep up with the production; pre-orders of their out of stock backpacks can take half a year to be fulfilled (as did mine). So, are there any other backpack options for the hiking photographer? Yes, panel loader backpacks! Unlike the usual backpack design that has cumbersome top-loading access with buckles and cinch straps, panel loaders have zippers that unzip the entire pack, allowing for quick and easy access to the contents within. The camera gear can be organized in a basic padded camera case (of which there are many options), and the case is simply placed into the panel loader backpack. This is essentially what F-stop has done, with a few extra bells and whistles. I’ve done a LOT of research lately trying to find the best panel loader backpack options for photography, and in this article I will share and review some of the options that I’ve found. No gear review would be complete without first explaining the reviewer’s own needs and requirements. In my case, as I’ve mentioned already, I am a hiking photographer. And not just short strolls; I frequently do long strenuous day hikes or backpacking treks in steep mountains and cold weather. Therefore, I need a high-performance backpack that can comfortably carry heavy loads consisting of about 10-15 pounds of SLR camera gear plus all the other normal hiking gear. And the pack should allow quick access to my camera so I can shoot when I have the impulse without hassling around with the backpack and its contents. 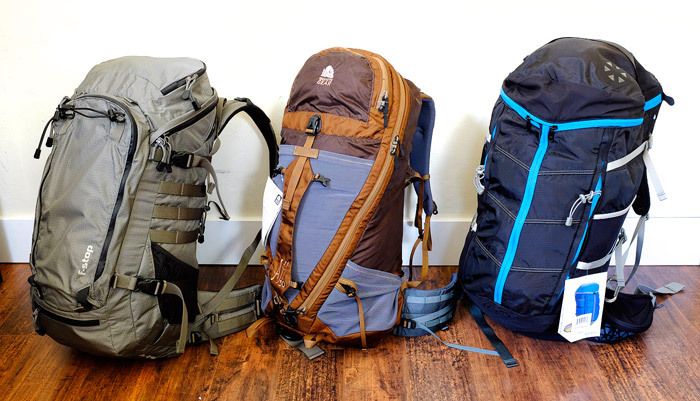 For the kind of hiking I do, I need two backpacks: a big one for multi-day backpacking treks with all the camping gear, and a smaller one for long day hikes, traveling, and hut trekking. I already have the big backpacking pack dialed – I use a custom built McHale panel loader for this. (More on this below). For the smaller backpack I’ve been searching for something in the 50-60 liter range – enough space for the camera gear plus possibly a couple changes of clothing, down jacket, rain jacket, rain pants, hat/beanie, gloves, pack towel, sleeping sack liner, headlamp and other small electronics, some food and water, and enough extra space for possible extra items like climbing harness, helmet, ice axe, or crampons (some of which could be lashed to the outside of the pack). All this gear (including the backpack) comes to a total of about 30-35 lb., give or take. As for camera gear, I currently use an average-sized SLR with three medium-short lenses. These fit into an f-stop small/shallow padded camera case. However, there are many, many options for padded camera cases like this; before this one I used a Tamrac bag which was also nice. The main difference to consider is that the f-stop opens up on its side while the Tamrac opens from the top; this could be better one way or the other depending on how it sits in the backpack. I’ll go ahead and talk about the F-stop Satori first, since in many respects it is the ideal model of what I’ve been looking for: 62-liter capacity, great camera access features, sturdy suspension with aluminum frame stays, and not too terribly heavy at just over 4 lbs. The Satori’s most unique feature – along with all their packs – is the back panel zipper entry. This is a brilliant feature which allows you to open the pack fully from the back side under the shoulder straps. This is even better than regular panel loading access, because it’s easier to just plop the backpack on the ground and access it from the back rather than flipping it over to access the front. I don’t know of any other similar sized backpack that offers this, except for the Dakine Guide pack (but with that one only the center section of the back panel zips open, which is not nearly as useful when trying to pull camera gear out). With the Satori the entire full width of the back panel zips open, allowing immediate access to your camera case, which you can also clip in place so that it stays positioned where you want it. Another neat feature of the Satori is how the entire top lid zips open, rather than the usual two buckles with cinch cord. Quick and easy. The Satori has a fixed 18.5″ torso length, which will probably work well for people with torso lengths within an inch or so of that. My torso is about 18″ and the pack fits me nicely – not perfect, but pretty darn good. The sturdy aluminum frame and thick padded waist belt handle heavy loads with ease. The 62-liter capacity is a perfect size for hut trekking, long day hikes with lots of gear, or possibly even overnight trips with minimal camping gear. I can fit everything I might need for those types of hikes without having to jam it in too tightly. The pack comes with an internal padded laptop pouch, but I promptly cut that out with a razor blade to lighten the pack and free up even more space. F-Stop packs are noticeably well-built, with tough materials, big burly zippers, and robust stitching; it seems the Satori will last a long time. With the Satori, F-Stop has struck a very nice balance between weight, sturdiness, and camera access features. This is a pack that hiking photographers will really appreciate, and even non-photographers should consider this pack due to it’s all around excellent design and access features. Now for the bad news. Not only are the packs arguably overpriced at $359, but the company has some serious problems with its production and they seem to be out of stock more than not. I pre-ordered a Satori back in January with a quoted delivery in March; but at the beginning of June still no Satori! With a big international trip looming I started scrambling to find alternative packs in case the Satori didn’t show up in time. (Thus, this article). True to their marketing efforts, the f-stop Satori is indeed the best overall option for the hiking photographer – if you can get your hands on one. But just be warned: you probably should not pre-order out of stock items from F-stop if you are impatient or have any kind of deadline! The Granite Gear Aji 50 (women’s version here) is an innovative panel loader pack and a truly viable alternative to F-stop. What makes this backpack so cool is a full wrap around panel loading zipper. You can zip it open from the top, from the bottom, or both! Although not at all marketed towards photographers, photogs will appreciate the way that the top section of the panel loader perfectly fits a slim camera case like the f-stop small-shallow icu. You can just zip it open, flip the top back, and boom, there’s your camera gear ready for you! At just over 2.5 lbs, this pack is also significantly lighter than the f-stop Satori. The weight savings does come at a cost though: the Aji 50 uses a plastic framesheet rather than aluminum stays, which means that it doesn’t handle super heavy loads quite as well. That said, when packed to the gills with my normal kit it still rides nicely on my back. You just wouldn’t want to fill it entirely with too many heavy lenses. The hip belts are very nice on this pack – pre-molded and sturdy, with multiple attachment points for accessory hip belt pouches. The Aji 50 is available in two torso length options: Regular (18-21″) or Large (21″ to 25″). I tried the Regular. You can also order different hip belt sizes as well. Sadly, although I fell in love with this pack design right away, I don’t think it’s going to work for me for my upcoming hut trekking travels. The 50 liter capacity fits all of my clothes and camera gear, but leaves absolutely no extra space for food and extra items like crampons, etc. If the pack were 60 liters and had stiffer aluminum suspension, it would really be tough to choose between this and the Satori. The Aji 50 would be a perfect backpack for a photographer with a smaller mirrorless camera setup, or for a non-photographer ultralight backpacker or traveler. For a full-SLR-kit photographer, I think it’s a bit too small for anything beyond a long day hike. But if that’s your intended use for the pack, it’s worth serious consideration over the Satori because of its lighter weight, lower cost, and very useful full-panel zip design. The Boreas Sapa Trek is another intriguing and innovative panel loading backpack. Instead of a more traditional wrap-around panel loading zipper, this one has a unique Y shape zipper system. The Y-shaped zipper system seems simple enough in theory, but after initial testing I found it to be a fairly flawed design. Firstly, compared to regular single-zip panel loaders, it is more complicated to zip open (three zip motions instead of just one). Also, it becomes tricky to fully load the pack because while you are cramming things in there, the zippers tend to want to zip open under the tension. Finally, there is no way to secure the main vertical zipper in the closed position; when the pack is fully loaded that zipper doesn’t always close all the way – it just sits there not fully zipped near the top, like pants with no belt or button. Considering that this zipper is holding all the tension of the pack contents, and it’s not a very big tough zipper to begin with, it seems like a bad design that could potentially fail with a heavy load. At about 3.5 lb. and 55L capacity, the Sapa Trek is heavier than the Aji 50 but also offers a little more space (though like I just mentioned it is difficult to fully load the pack). It too utilizes a plastic framesheet suspension instead of aluminum stays, so again you won’t want to load this thing up with too many lenses. The Sapa Trek is also available in two different torso sizes: Medium (19″) or Large (20.5″). Although my torso length is only one inch shorter than the medium, I found it to be way too large for me. Just didn’t fit me at all. I was excited about the Sapa Trek when I researched it, but was quickly disappointed with the Y-zip design when I tried it out in person. Non-photographers might like this pack for traveling, but I think in almost every sense the Granite Gear Aji 50 is a superior pack for anybody. A far-fetched solution for most people, but worth mentioning, is the possibility of having Dan McHale in Seattle build a custom backpack for you. 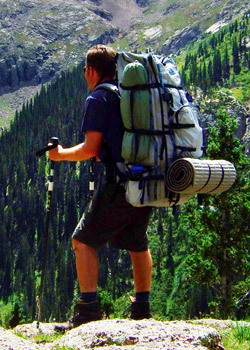 I’ve been using the same big McHale panel loader backpack since 2007 for my backpacking treks. These are streamlined, no-frills backpacks, but they are built to your exact custom fit and specifications, they are tough as nails, and they carry a heavy load better than probably any other backpack on the market. As you would expect from a handmade, custom created item, McHale packs are very expensive and the process takes some time to get through. But the pack will fit you perfectly and will last a lifetime. For multi-day backpacking treks with full camping gear, when comfortably carrying a heavy load is of utmost importance, I do believe this is the best option of all (if you backpack frequently enough to justify the high entry fee). It would be possible of course to have Dan build a panel loader like this but smaller for traveling, long day hikes, and hut treks. But in these cases weight is not such a critical factor, so it probably makes sense to look at the other much less expensive options. UPDATE, JUNE 2015: Take pretty much everything I just said about the McHale, refine the details, cut the price in half, and you have my new favorite heavy-hauler backpack: the Seek Outside Unaweep-Exposure panel loader backpack. 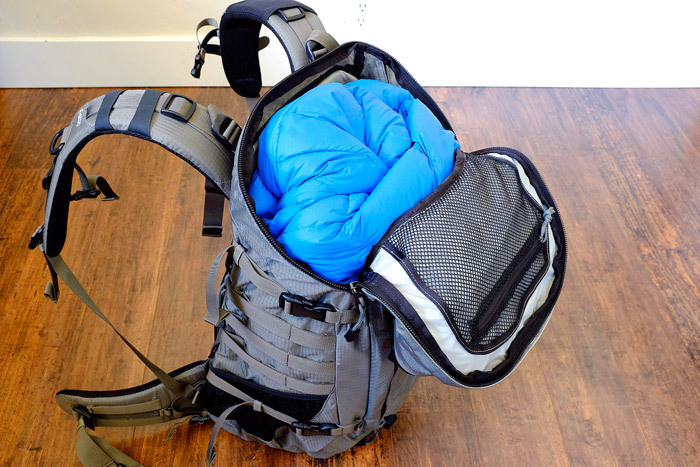 This backpack, which I actually helped to design the detail features on, is lightweight at 3.5 pounds, and carries heavy loads even better than the McHale and certainly better than any other packs in this article. Read my full review of the Seek Outside Exposure here. The packs I reviewed above are the ones I most considered buying and trying out for various reasons, but they are not the only ones on the market. Though I haven’t seen any of the following in person, here are a few more options worth researching. If you know of any other good panel loaders, please let me know in the comments below! Kelty Redwing 50: 52 liter, 3 lbs 4oz., big side pockets, ventilated back panel. ULA Camino: 40+ liter capacity, lightweight at 3 lbs, two aluminum stays with foam framesheet, available in four sizes. Mountainsmith Ghost 50: 50 liter, almost 4 lbs, vented back panel, adjustable torso length, kind of a goofy shape(?). Clik Elite Contrejour 40: At 40 liters, this pack would be smaller than the target size I’m reviewing in this article, but worth a look because of its photography-oriented design features. Naneu Adventure Outlander 50L: This pack features an innovative integrated removable camera case. There’s also a larger 80L volume model. For multi-day backpacking treks with full SLR kit, camping gear, and lots of food to carry, the Seek Outside Exposure or a custom McHale panel loader wins hands down. Your back will thank you for it! For hut trekking (when you don’t need to bring all the camping gear) or short overnight backpack trips, with a full SLR kit, the f-stop Satori gets the award due to its overall balance of spacious capacity, heavier load carrying capability, and excellent camera gear access. This would also be the best choice for any kind of day hikes if you’re carrying a huge camera kit with lots of lenses. For long day hikes with basic SLR gear, or for hut treks or short-term backpacking with a small mirrorless camera kit, the Granite Gear Aji 50 wins because of its lightweight, streamlined design and hyper-convenient all-the-way-around panel access. UPDATE: JUNE 2015: The Seek Outside Exposure is THE pack for serious hiking, regardless of the demands I just listed. It’s lighter than the Satori and carries heavy loads far more comfortably. The Satori does have better access and more organizational features, and is small enough to carry-on airplanes, but for any kind of hiking the Exposure totally outperforms it. Posted in Gear on June 12, 2013 June 29, 2015 by Jack Brauer. Really appreciate your information, photos, and knowledge here – incredibly valuable! Glad you found it useful, Paul! Gear reviews are a somewhat tedious affair but I’ve done so much research lately that I figured I might as well share my thoughts. Thanks for letting us take advantage of your research, Jack! I’ve had my eye out for a good solution for a while, and I may bite the bullet and go for an F-Stop eventually. But meanwhile, I want to do some experimentation to see if I can find a viable way to rig a LowePro toploader case so its weight hangs on my current pack’s suspension instead of on my neck. We’ll see…. or maybe some pack company will hit one out of the park in the meantime. Hi Jackson, I used to carry my SLR that way – I rigged up my own system with plastic clips, webbing, and elastic bands for the bottom two straps – the top loader could then clip onto my shoulder straps and ride comfortably and securely on my chest. There are a number of reasons I abandoned that method: first, I always use a tripod with my SLR so I have to take my pack off for that anyways. Secondly, I have too many lenses to carry in one chest pouch (that only really makes sense if you have a standard zoom lens). Finally, that system kind of makes it a pain to put your backpack on and off. But, for a handheld shooter with a do-it-all zoom lens, that’s definitely the way to go for quick easy access! And then of course you can use whatever backpack you want. I haven’t used their products but they appear to be well built and comparable to the F-Stop packs. That said I have one of the F-Stop Loka bags and really like it. Thanks Brian for the suggestion! I took a look on the Clik Elite website and the Contrejour 40 seems like it would be the best model they offer for what I’m talking about in this article. A bit on the small side, but perhaps good for day hikes. I’ve added it to the list of alternatives above. Some of their other packs are ridiculously heavy, though. I have been using a Lowe Alpine bag (don’t know the name of it and I can’t check right now) for a few years after the same kind of search you have been on. The pack is lightweight to start, but the best feature is the side opening. From the base to just above half height a big zip opens up and I have the organiser from an old Lowepro bag in there. It happily carries a D700 with 2 lenses, flash and extras. In the side flap there is a mesh pocket which holds a Lee filter system, adapters and all. 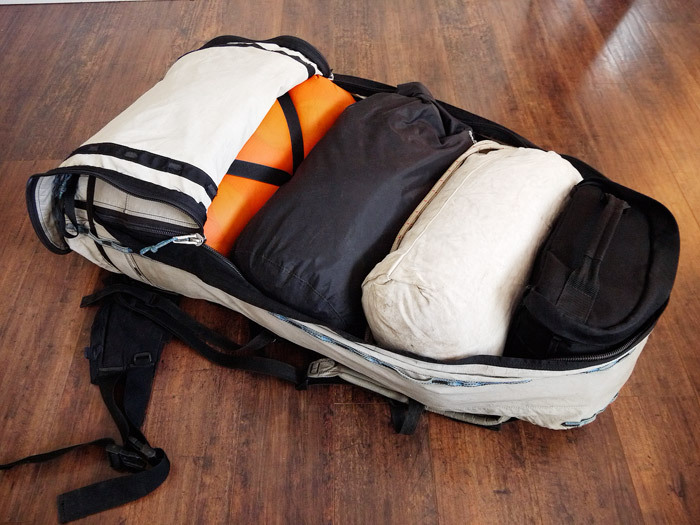 This folds down nicely on top of the camera gear inside and leaves 1/3 to 1/2 of the bag’s interior for … stuff. I do have photos of it in use, but they are not online. Another option for those slightly less adventurous than yourself and a host of unused Lowepro camera bags in the house. I can’t be the only one?! Hi Steven, thanks for your comment. It would definitely help to know what model you’re talking about. Thanks for the post, I’ve felt that photo backpacks have been lacking for a long time and I’m looking forward to having more bags to fill this niche soon. I don’t get to backpack too often but when I do it’s usually for more than a couple of days. And I’m usually just putting the camera and one lens into a dry bag and second lens in a dry bag and packing it in a semi-protected spot in the pack. The F-Stop packs look great but I think I would want a bag that would work for longer trips! Awesome work Jack and really appreciate you sharing your insights on the blog! Wow, couldn’t agree more about the short comings of mainstream photo backpack designs. These 4 and 5 lb camera storage-centric day packs are ludicrous for the hiking/backpacking photographer. I have not yet dived in to the full custom/crazy expensive solution, but I think I will shortly. Like so many areas in the outdoor gear industry, the dedicated outdoors people are left hanging above a sea of ridiculous designs and marketing hype a la Archwoodflex 37 trillion. That being said, the granite gear pack looks like a great bag, thanks so much for the info. The other day, put down the heavy as hell TSE lenses and headed out on the landscape with only my gitzo, a contax 35-70 and a voigtlander 20mm color skopar. And I must say, it was positively liberating. Hi Jack, I’m wondering what you do with your tripod on these packs. Is there room inside or do you strap it to the outside? Hi Marcus, I usually strap the tripod on the outside; however when I’m traveling on airplane, bus, etc. I put the tripod inside the pack. Most packs like these have room to fit a tripod like mine (Gitzo Mountaineer series) and if not you can pull out the center column of the tripod to make it shorter. But when I’m hiking I strap it on the outside for quick access. Many thanks for posting this as I’m going through this process right now. A quick question regarding the GG Aji50. Would the Slim Small ICU fit in the bottom of the pack so you could open from the bottom? I’m looking at this exact setup (or maybe a micro ICU as I’m shooting now a full micro 4/3 setup), but would prefer the camera equipment on the bottom. Hi Michael, yes the small/shallow ICU would definitely fit into the bottom. The only problem though is that there’s probably TOO much space down there, so you’d want to fill the excess space with a jacket or something like that – but then you’d have to pull the jacket out to access the camera. The top of the pack fits the ICU perfectly because of the way that the inner compartment tapers towards the top, with the top pocket overlaying that area. It’s hard to explain in words but that top flap really unzips and folds over nicely, exposing the ICU quickly. But of course then the camera weight is riding a bit higher on your back (which I like, but you may not). I did a lot of searching myself for this type of rucksack before I found this very useful article. I’m UK based, but the best gear tended to be American, and can some times be difficult to source in the UK. 3) Around 40 L capacity for a day trip. Here are some additional backpacks I considered. The Gregory z40 met the above and is the one I’ve gone with. It comes in three sizes the largest covering torso lengths of 20 to 22″, front loading panel and frame supported away from your back. Another Gregory was the Savant, which comes in three capacities of 58, 48 & 38, but only 58 & 48 have front access. As it is a bit bigger pack it is against your back with ribbing. Front panel and three sizes of torso length. I really liked the look of Osprey rucksacks with great torso adjustment, but they don’t have complete front access. The Osprey Aether 60 & 70 have partial front access in that it has a “J” shaped zip going from bottom left to top right. It is up against your back. Vango do several ruck sacks with front opening, but I couldn’t find info on torso lengths. Came across your website while searching for alternatives to the F-stop Loka. While doing my own research, I saw the Gregory Targhee pack. The main compartment of the pack can be accessed from the back, much like the F-stop bags. I have not used this pack, but looks like a potential candidate for an F-stop replacement. Only downside that I see from the specs, is that it is not an ultralight pack . The 30L is 1.5kg. Add a F-stop ICU to this, and the pack will easily cross 2kg. Great post, thanks for the insights. I’m searching for a viable pack that I can take on a two-week trip to Europe over the summer. Last year I survived with a 50L REI pack that I just tossed my camera and extra lens into, which was fine for transport but definitely not great for access. Every time I needed my camera I had to paw through my two weeks worth of clothing. I also don’t want a pack so large that I can’t bring it onto the airplane with me. I’m thinking an F-stop might be the way to go, or sucking it up and using my normal backpack and getting a smaller Lowpro camera bag to wear in addition to my pack. Definitely going to take these reviews into consideration. Thanks for the advice! Hey I’m not a camera guy but I liked your gear review as I’m thinking about getting the Aji Ki for my sister. You might want to check out the new Granite Gear Nimbus Trace Access 70 — it’s a panel loader in a larger size and with a beefier frame. Cheers! Hi Matt, thanks for the suggestion! Me thinks that the panel zipper in the Nimbus Trace is too narrow for camera gear; that said, it looks like an awesome pack anyways! Have you guys checked out the MindShift Gear Rotation 180 packs? They provide a great solution for accessing your camera gear easily. Very helpful article Jack (and thanks to some of the comments too!). I didn’t know about a couple of these bags, so thank you. I too am frustrated with the manufacturers and cant believe someone like Gregory can’t figure this out. I’m one of these people that is cursed with overactive sweat glands…I need a bag with a tensioned frame that will get the “bag” off my back and lets some air flow through (the new web fabrics are not enough). And I want a real camera bag…not an open pack that I have to stuff a real camera bag into. I use a CaseLogic backpack now…I love it’s camera bag, but absolutely hate it as a backpack. I’m stunned that LowePro can’t pay more attention to pack frame technology. I’ve written Gregory–I suggest we all do the same…maybe if they hear enough of our pleas for help, they’ll do something…I like their CrossFLO technology…just need a camera bag built into it! As I told them, I’m a photographer/day-hiker…other than camera, lenses and tripod, I’m carrying a windbreaker, water, snacks and some very minimal survival tools like bear spray, flashlight, exposure bag and fire starter. Maybe I’m the only one that feels he needs a tensioned system to get the bag off my back…I’m interested to hear your thoughts. Which ICU would recomend for the Satori? Hi Abraham, It would just depend on how much camera gear you have. I use a Small Shallow ICU, which holds my camera with lens attached, along with two other lenses and a couple filters and spare batteries. The lenses I use are small to medium in size (mostly wide angles, no long lenses). I have a torso size of 14″, so the options are pretty limited for me. I just got an extra-small Osprey Ariel women’s’ pack, which adjusts down to 14″, and will be trying it out. It seems to me that the limited-zip packs might be better used with individual lens wraps, rather than large “ICU” cases. Granite Gear suspensions looked interesting, but there is no local source for GG packs, so I skipped trying the GG Nimbus Trace Access women’s version.. A large format photographer (photobackpacker.com) has made his own boutique front-panel-loading pack based on the Granite Gear Nimbus -type framesheet and interchangeable belt/harness – it looks like a good idea, provided the GG suspension fits you well. There is an additional sheet to which one attaches various lens cases, camera cases (there are options for SLRs, mirrorless, MF, as well as 4 x 5 to 8 x 10 cameras), etc – the pack may carry pretty well. The pack is pretty much designed for photographers, not for trekker-photographers. Check out Dakine! Little bigger. I used to have one, actually. Problem with DaKine’s panel loaders is that only a narrow section of the back is a panel, not the whole back. So it becomes more difficult to pull out the camera case. I’ve admired your photography for some time and this was a really good read. I’m considering some overnight/two-night treks in the UK over Spring/Summer/Autumn and came across your blog at the right time. I use a large format film system, of which the camera/lenses and film holders are light at least (Chamonix 045n-2) but more bulky than SLR equipment. I’ve weighed my camera/lenses and film holders I would take on such trips and they come in at around 3 Kg, not including filters! But that bulk is an issue. I know you used to trek with a large format film system – what did you use then to carry it? I’m a small guy (5’9″, 140 lb) who’s fit and strong but to me getting a real hiking rucksack makes sense over a camera one. I use an osprey 45L pack and fstop ICU when day trekking and wouldn’t take all my gear on such overnighters. I reckon I fit the bare essentials into a medium shallow ICU and stuff that in a real pack. So, have you seen or come across this pack: Arcteryx Altra 65? It’s supposed to be real comfortable to carry upto 60lb (!) with a fancy innovative suspension/harness system. It’s a panel loader and expands from 65 to 73L with a front kangaroo pocket, to stash wet items I guess. Any opinions on it? Would it be too large? Only downside is cost! Hi Graham, I used to shoot 4×5 also; though my setup weighed around 9kg! That’s as low as I could get the weight, with three lenses and film and tripod. For that I used a custom McHale panel loader, (and still use it; it’s a great backpack). 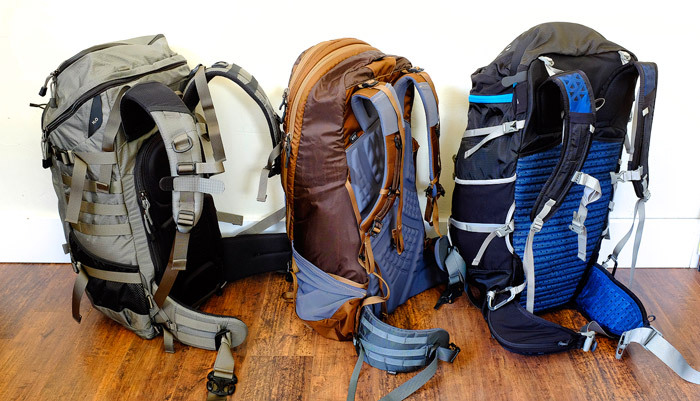 These packs are great for heavy loads, but are very expensive. I have not seen the Arcteryx Altra 65 in person. Looking at online pictures it looks ok but it’s not a true panel loader, it’s got side zippers not a full wraparound zipper (as far as I can tell) and even if it did you’d have to undo the top pouch first. So you wouldn’t really have the easy access benefits of a real panel loader. Recently I’ve tried on a Paradox Pack, based right here in Ouray. They are building me a modified version of their Unaweep pack, with a full panel loader zipper. But after testing a loaded Unaweep I can tell you it carries a load so nicely, even better than my custom McHale pack — which is almost unbelievable to me. Needless to say, I am excited for this pack and will post a review of it once I’ve used it. If it works out well they might offer a panel loader standard option for photographers like us. Thanks for your reply! I’ve checked out video’s of the Altra 65 and it does properly open as a panel loader but you have to undo 8 buckles and the zipper is not watertight, like it is on the lid. Well, not too much of an issue because I’m hardly rushing to take a photo when using large format! I’d never heard of Paradox Packs. Had a look at their website. Like the idea of the Evolution with the base talon. Storing the camera in the base talon (if it fits) would then provide a ready to go daypack for walks away from a base camp. Shame it has zips along the side but not all the way round. Hope you can have a strong word with them!!! Yeah 8 buckles is a no-go for me… that would drive me nuts! As for Paradox Packs, I think you misunderstood me — they ARE building me a full wrap-around panel loader model as we speak! In fact today I just tried a prototype version. It’s awesome!!! I will post a review once I have it and have used it. They are going to make that a standard model on offer on their website in the near future. Look forward to that review then Jack! I like the idea of the equipment in the bottom part, if by chance a heavy rain gets the photographer unprepared, it will give some time t protect it. Ok, I am in tropical area, where very heavy shower came in seconds. I am looking for a backpack to carry my 360° panoramic gear. It is basically a robot with a D810 attached and lenses from 10,5 to 35 mm. I would like to be able to load this gear from the top. Here is a link to the gear. You will find the dimensions on the image. What would be your suggestions? The depth of this gear is the depth of a D810, around 5.5 inches. Just left a comment and question elsewhere under the write-up on the SO Exposure 5000 pack. An earlier post in this thread was discussing a chest-pack set up. I’ve been using a Think Tank Digital Holster 10 to carry a camera (Sony NEX-7) and one extra lens. It sits on my chest and attaches to the pack (more easily with an external frame) with three connection s straps, two on one side and one on the other. The two straps on one side stay connected to the pack, and the one on the other gets attached/detached when putting the pack on and taking it off. The holster stays with the pack, so you kind of have to keep track of it so you don’t smush it when you drop you pack. It comes with a tucked-away rain cover, easy to pull out if needed. There’s a little, expandable section on the bottom that will hold a small lens, with the camera on top. Advantages: Camera is handy and protected. Takes a few seconds to take out and put back without having to stop and remove your main pack. The suspension system keeps the rig pretty stable so it’s not bouncing around on your chest. Holds a camera with lens attached plus an extra lens on the bottom. Disadvantages: The added strappage makes putting on and taking off your pack a little tedious, but it gets easier the more you do it. At about a pound, the holster and straps add a bit of weight. Just wanted to mention this as another option for carrying a camera. Oh, and spectacular work, by the way!